I am not sure how anyone figured out how or why you would use Pickle Juice for the following items but I am glad they did. Here at R29, we try and stay on the cutting edge — always on the lookout for that new wonder product that will change your life. Today, we may have discovered the ultimate power player: pickle juice. Yes, that green stuff leftover at the bottom of the jar. It does, essentially, everything. 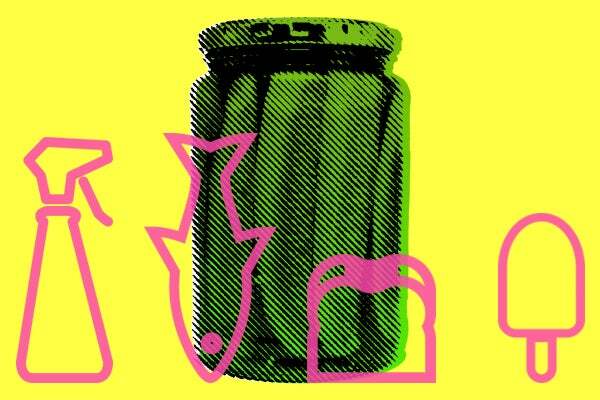 What started with an anecdote about an old hangover cure turned into a little curious Googling, and soon we discovered a wealth of pickle-juice uses so vast we couldn’t keep it to ourselves. Looking for a natural weed killer? A PMS remedy? A trendy new cocktail? A wunderkind ingredient for healthy cooking? The answer is pickle juice. Seriously. Here are a whopping 17 uses for this miracle product. Got anymore favorites? Forget coconut water. Athletes swear by pickle juice’s scientifically proven benefits to exercise recovery. In one 2010 study, pickle juice halted post-workout muscle cramps in 85 seconds. That, plus its electrolyte-restoring powers has even yielded Pickle Juice Sport — a dill-flavored sports drink. But really, most athletes stick to good old Vlasic! Pickle juice has amazing meat-tenderizing abilities and, as a marinade, will add a ton of flavor to your meats, without the extra cals in heavy sauces or marinades. It works exceptionally well on chicken — some claim a skinless breast soaked overnight in pickle juice will taste like fried chicken when cooked, and we say that is voodoo but we’re okay with it. Try it on cuts of pork and beef, too.